Ye dandled upon your knee. And throwed it into the sea. The prince’s bed and me. To stand before the line. And shine through Edinbro’ town. She was condemned to die. Save that all is well with me. From the singing of Austin Faricy, formerly of Austin, Minnesota, as learned by Sam Hinton. Hinton recorded it for the Library of Congress in 1947; his version is available on the recording “Sam Hinton: The Library of Congress Recordings,” on Bear Family records. Hinton does not say where Faricy learned it, but it uses the most common tune for “Mary Hamilton,” and the words are pretty standard also. It is possible that Faricy had it from a recording, but still, Hinton collected it from a Minnesotan…. If you want to understand what it is to be a Scot, the first place to look may well be the ballads. Although there are fine ballads from England, Ireland, and the United States, the a disproportionate share of the most heart-wrenching are Scottish. This definitely is an example. Mary Stewart (“Mary Queen of Scots”) became Queen of Scotland before she was a week old; her father James V, already ill, was said to have turned his face to the wall when he learned his only legitimate child was a daughter, and promptly died. Soon after, in England, King Henry VIII — Mary’s great-uncle — was putting together plans to take over Scotland by having Mary (born 1542) wed his only son Edward VI (born 1537). The Scots were not interested, so Henry turned to the “Rough Wooing” — he intended to conquer Scotland, or at least force them to ask for peace, and marry Edward and Mary whether the Scots wanted it or not. The Scots had a better idea. They would send little Mary to France, their long-time ally. This was done soon after Henry died. When Mary went to France, it was decided to send four well-born Scots girls with her for company. They came to be known as the “Four Maries,” since all were named Mary: Mary Seton, Mary Beaton, Mary Livingston, and Mary Fleming. While in France, Queen Mary was married to the heir to the French throne. When Henry II died in 1559, her husband Frances II became King of France — and Mary Stuart (as she now spelled it, to match French spelling conventions) was Queen of France. They also claimed to be King and Queen of England, since — under Catholic law — Elizabeth I of England was illegitimate and Mary was the next in line for the throne. History would doubtless have been very different had little Francis II, Mary Stewart’s husband, lived longer. But he died in 1560, and the couple had no children. Mary was still Queen of Scotland — but Queen of a land she could hardly remember, whose language she had nearly forgotten, and which in her absence had turned Protestant. She went home, but she did not understand the country she now ruled. By the time she was 25, she had been deposed and forced to flee to England — to the country of Elizabeth I, whom she claimed was not Queen! Before her deposition, Mary had taken as her second husband Henry, Lord Darnley. He was, by different lines, her half first cousin and second cousin, and the next in line for the English throne after Mary herself, and was probably the next in line for the Scottish throne as well (this was a little more dubious, because of a complicated question about the legitimacy of some other relatives. For the complex story of this, see the genealogy). As her husband and the heir to the throne, he wanted to be declared King of Scotland. This seemed straightforward enough — after all, if he and Mary had a child, the child would be the next monarch, and if they didn’t, then Darnley would be King in his own right. But Mary, although styling him “King” when she married him, later officially denied him the Crown Matrimonial. That helped sour a relationship that was already going bad; Mary and Darnley soon came to hate each other. 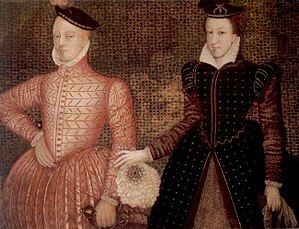 They had one child, the future James VI of Scotland and James I of England — but were soon separated, and in early 1567, Darnley was murdered. It is not known whether Mary had anything to do with his murder, but later in the year, she became involved with the Earl of Bothwell, and his behavior caused her to be forced from the throne. She arrived in England in 1567, and eventually her intriguing forced Eliabeth I to execute her in 1587. But when Elizbeth died in 1603, she let Mary’s son James succeed her, and finally England and Scotland were united. The mention of the Four Maries in this song obviously seems to imply a setting in the court of Mary Stewart, after her return to Scotland. But there is no historical record of anything like this happening. Ballad scholars have gone so far as to ring in a Mary Hamilton who got herself in trouble in Czarist Russia to explain the origin of this ballad. But the most likely explanation is that a rather pitiful plot about a queen’s lady-in-waiting somehow was attached to the story of Mary Stewart. This would explain some of the confusion in the lyrics: When Mary Hamilton bore her child “to the highest Stewart o’ all,” does that mean that Darnley was the father? Or merely that she bore the child while in the service of Queen Mary, who was the true “highest Stewart”? We cannot answer; indeed, the versions are inconsistent upon this point. The text below is a composite of the various Scots versions I have learned over the years, which tries to give a feeling for what the song perhaps originally looked like. I’m presenting it in Braid Scots (with glosses), rather than anglicizing it, because, first, it’s better that way, and second, there are several places where an anglicized version becomes difficult to sing. I saw and heard greet by thee. . But ne’er return tae me. .
“Ye needna weep for me. This necht there’ll be but three. And Mary Carmichael and me. .